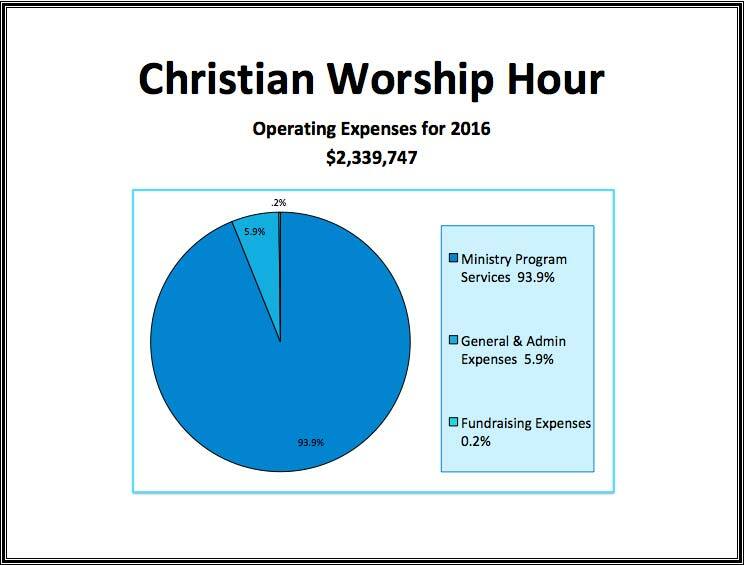 The Christian Worship Hour is accredited by the Evangelical Council for Financial Accountability (ECFA). Our membership profile with the ECFA can be found here. In our 30-year history, we have never begged for money nor have we ever been criticized for our handling of funds. Now this accreditation verifies that fact. We thank all who have supported our ministry and we are happy our integrity can be reinforced by an organization like the ECFA. When you give to the Christian Worship Hour you can be assured your gift is carefully, wisely used to advance the Gospel of Jesus Christ into all the world! There can be no question about it. We are pleased to report that 93.9% of all contributions go toward direct ministry expenditures. Please be aware that our only source of income is from our viewers.